choice of templates just add your images, logos, text, special dates and adverts. Everything you need to know about fundraising calendars is right here. We have helped thousands of fundraisers create great quality, cost effective calendars to sell for profit and we can do the same for you too! Browse our fundraising page, if you have any questions please contact us. Which is the most popular calendar for fundraisers? Of our entire calendar range the A4 size wall calendar in the 7 leaf option is the most popular. Printed on both sides this saves paper and is better for the environment but most importantly it costs you less. 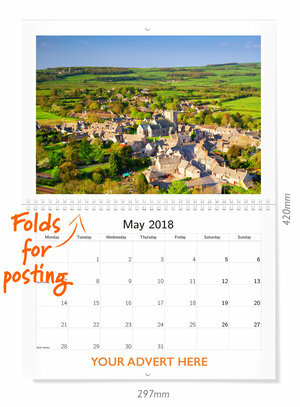 The preferred fundraiser calendars are shown below, available in grid, column or planner date formats along with a selection of single or multi picture layouts per page. To view prices and options click on an image below. Increase your profits by getting local businesses or individuals to sponsor your calendar. 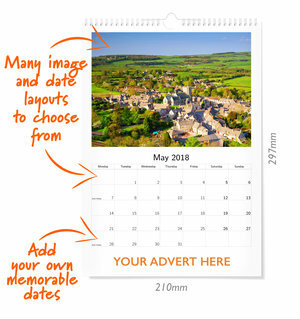 In our experience, most businesses will readily pay £30-£50 to sponsor a calendar month. Some fundraisers manage to find two or more sponsors per month resulting in a profit before a single calendar is sold. Sponsorship doesn’t need to be limited to a banner advert at the bottom of the page. On the grid style layout there are spare boxes* which could have an advert within them. You can also add adverts around the main image itself. If you would like to do this and you are using our DIY Online Calendar Designer you will need to upload the main image and surrounding adverts as one image - you can do this in a program such as Photoshop. If you are fundraising for a school or community you could also sell birthday messages. The messages can be displayed around the main image, using the above method, or in the spare boxes* on the calendar grid. Our fundraising customers usually charge £5 per greeting. *Please note that adding adverts or text to the spare boxes on the calendar grid can only currently be done using our Calendar Design Service. NB: Please ensure you have the necessary permissions to use any photographs within your fundraising calendar. is £5 with some charging up to £12.99. You can also offer discounts for multiple purchases to increase sales. Make in excess of £1000 profit! Give added value to your calendar by including important dates and information. We value our loyal customers and say thank you by giving them a 10% discount on every order. We want you to be confident in our service and product. Our calendars are professionally produced in the UK. See the print quality. Feel the paper thickness. Order your FREE sample today.